Summary: Big and tall, with womanly curves that belie her 15 years, Xiomara Batista is hard to miss. 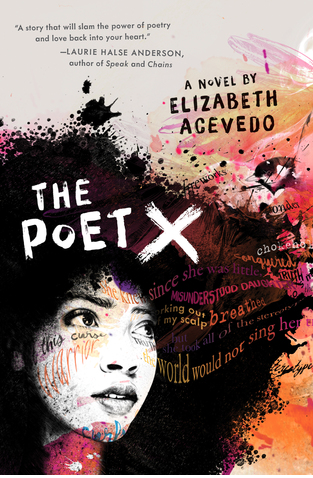 And yet, Xio feels largely unseen: to the kids at her school, she is a "ho" or "fast" because of the shape of her body; to her uber-religious mother, she is sin waiting to happen; to her father, she is invisible. But deep inside, where nobody else sees, Xio is a poet. She is full of feelings, and they have nowhere else to go, except her notebook. Her life changes when her English teacher invites her to join the Poetry Club, where students perform their work, and also, she starts developing feelings for a boy in her class, knowing that anything having to do with boys is absolutely forbidden by her mother. Xio's journey through faith and doubt, first love, and the bonds of family is told in poetry. As a daughter of immigrants, I found this story entirely relatable. In her talk, Acevedo talked about how hard it is to learn that maybe your parents don't know everything, or maybe their viewpoints aren't the most "woke," and especially if you're young, it's really hard to be the one who tries to teach your parents certain perspectives, especially if they are really set in their ways. Xio's mother is stiflingly religious, and Xio has grown up with the viewpoint that her body, her existence, is the cause of other people's (MEN'S) impure thoughts, and she's grappling with that because obviously it's not her fault that her body matured early. The poetry in this book is stunning, and there were so many turns of phrase that had me tearing up. And I feel like I have SO much to say, but at the same time, I'm not sure how to say it, but I really, really loved this book, and I highly recommend listening to the audiobook if you can! This might be one of my favorites of the year.